We are excited to announce a new innovative medical skin treatment called PRX-T33. A revolution in skin bio-revitalisation that will leave your skin feeling firmer, tighter, lifted and an enviable glowing appearance. It is a skin rejuvenator; an biostimulator, a redermalising product. It is pain free with no down time. It is in the same category as a medical peel and benefits from the same results; however with this treatment you do not peel so there is no downtime. Due to the unique composition of PRX-T33, the solution very quickly, almost instantly penetrates the dermis, activates all the processes of skin regeneration/renewal, however, does not damage the epidermis at all. 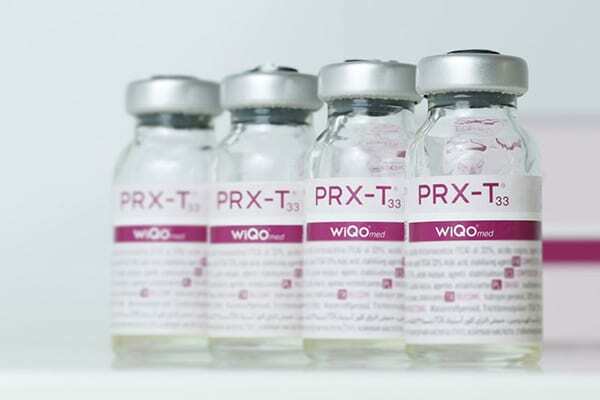 What is in the PRX-T33? Each molecule of PRX-T33® contains a unique combination of 33% TCA, hydrogen peroxide (H2O2) and 5% kojic acid. Due to this, PRX-T33® is not as “aggressive” as pure TCA. This ingredient stimulates the growth of fibroblasts in the skin, at the same time it has an anti-inflammatory effect, effectively cleans pores from accumulated cutaneous fat, debris of cosmetics and micro particles of dirt, destroys pathogenic bacteria that cause acne formation, and increases the elasticity of the dermis. This ingredients has a strong antiseptic effect on the treated area of the skin. Upon contact with the epidermis, hydrogen peroxide promotes the release of a huge amount of oxygen, which mechanically cleans the skin surface from all types of contaminants. In addition, hydrogen peroxide fills skin cells with pure oxygen which increases the sensitivity of receptors. The main purpose of this component is to brighten the treated area of the face. The chemical composition of this acid suppresses the production of melanin. Formerly, it was used to eliminate pigmentation, freckles, to remove traces of post-acne, chickenpox, small scars and cicatrices. This way a long and painful procedure turned into a quick and painless one. What type of skin can this treat?